If you’ve been wanting to start a Facebook group, this is a good place to start! I’ll update with what’s changing in Facebook groups as it rolls out! If you’ve been around for a while, you KNOW how important Facebook groups are to me! I wrote a post for Jane Friedman about using Facebook pages vs Facebook groups and have been steadily growing my Create If Writing Facebook group since I started the podcast in 2015. But things are always changing on the internet and some HUGE Facebook groups updates are taking place in 2017 that we need to discuss. Like my reach dropping in my own group as it did on my Facebook page. GASP! We’ll talk about the Facebook group updates, some educated guesses for what we can expect, best practices for using Facebook groups, and why some HUGE Facebook groups just closed their doors. While these SOUND like great things for group admins, this new focus may NOT be a great thing for group owners overall. Unless you like the changes that happened to Facebook Pages after 2014. If you have had your Facebook page before 2014, you know why that date matters. In 2014 Facebook began rolling out changes that greatly impacted the organic (aka: unpaid) reach of Facebook pages. Pages suddenly went from having a decent number of their followers see their posts to almost NO followers see their posts. I found this post on the Social Media Examiner from back in 2014 talking about reach— this was just the beginning of this issue for page owners. No one HAD to talk about reach before this, because it wasn’t a problem. Before 2014, if people liked your page —> people saw your post. That was it. Facebook may be about user experience, but Facebook is also about FACEBOOK. Particularly how Facebook can make money. Over a year ago, Facebook said that it was running out of space to show ads. With more people than ever using ads, this means that Facebook needs more spaces to show ads. Facebook has added messenger ads for pages (contributing to the rise in bots), but also has been testing Facebook in-messenger ads on the home screen. For a long time I’ve also heard murmurings of Facebook moving to ads inside of groups as well. I think the new focus on groups means that we are not far off from this. Because Facebook is still rolling things out, it’s hard to know for sure what the paid piece will look like. But here are a few educated guesses based on what I’ve heard from other group owners as well as what I’ve seen. As Facebook rolls out features, sometimes they are there one minute, gone the next. When I have linked my page to my group (see this tutorial to do so), I have sometimes seen the option to boost my post IN THE GROUP. This has mostly been on mobile and isn’t always available. I’m not a huge fan of boosting posts in general, so I haven’t clicked to see how this will play out. But the fact that I’ve seen the option indicates that this will become akin to boosting a post on a page. One of the larger entrepreneurial groups I’m in had a discussion a few months ago about targeting ads to groups. Right now as you create Facebook ads, you can target custom or lookalike audiences, people who like certain pages, or other demographics. I would guess that soon this would add Facebook GROUPS. The debate inside the group was about whether your ads would show up IN the group or if you would just be seen in the newsfeed of people from a particular group. Some claimed to have seen ads inside of larger Facebook groups. If the Facebook newsfeed is running out of room, it makes sense for ads to show up inside of groups. Jenn from Jenn’s Trends agrees! SO WHY ARE BIG FACEBOOK GROUPS CLOSING? Several HUGE Facebook groups have shut down in the past month, just as Facebook announced these new changes. Coincidence? I actually do think so. But it’s definitely worth mentioning! Melyssa Griffin archived her Facebook group, Online Biz BFFs, which hit over 70k members before cleaning out 1-2k people and archiving the group. This means that posts are still visible, but you can’t comment or post. She cited a difference in vision from the time she started the group. Screw the 9 to 5 closed their 40k member Facebook group in summer 2017. This after actively building the group as their main focus and building a huge part of their brand ON the idea of building a Facebook group. Founders Josh & Jill opened a new group that has about 5k members currently. To join the new group, potential members must answer questions about what they’ll bring to the group and making clear that spammy posts aren’t allowed. I think there are some takeaways from these successful groups that I’ll weave into my tips for Facebook groups below. But in short, I don’t think that these groups shut down because of impending Facebook-group-acalpyse. While Facebook is rolling out a scheduling feature, scheduling may not be the best option. Groups are about engagement and connection. Nothing creates a disconnect quite like a scheduled & automated post asking for “conversation.” If the group owner can’t take the time to be present to START a conversation, it’s not really a conversation. Facebook also has become more strict about outside schedulers and at least one group owner I know was banned by Facebook from using a scheduler in her group. I see plenty of group owners still scheduling with third parties (so FB seems to be dropping the hammer on this arbitrarily), but it alerts the group members to the fact that you aren’t THERE. The more people in a group, the more to manage. I remember feeling nervous and excited when my group went over 1000 members. It’s a great milestone…but at the same time, that means a lot of people I don’t KNOW. Group owners don’t just need to be present. They need to set the TONE. Part of that means moderation. This part isn’t always fun. Many Facebook groups just exist for promotion. And many people have taught that you should get into Facebook groups to find your ideal customers. What this means is that in basically ANY Facebook group, you’ll have a decent percentage of people who join and then immediately and frequently post links to their latest blog post/book/thing. Each week I delete posts and remove members. Each week I have a few posts on the fence where I have to decide if I want to kick someone out or take the time to message them, sharing why I deleted their post. I can’t imagine how many spammy, self-promote-y posts got deleted in those large groups that have now closed down. Several of them had team members and paid positions to manage the groups. In each of those three large groups, members could see a ton of spammy posts that still made it through (even temporarily), or thinly-veiled posts just trying to build a business on top of the hard work the group owner did to build the group. It’s a LOT of work to moderate, especially as the group grows. Without that work, though, the value of the group goes down. You can ask questions now as people join the group, which is a great way to vet people at least a tiny bit. With the linking of Facebook groups, I ran a little experiment. When I posted as my PAGE (something that you can do when you link your group and page), my reach tanked. When I posted from my personal PROFILE, my reach was fine. If you are going to link your page and profile, this is probably the first way that Facebook is going tin adjust the organic reach. You can see here that the top 5 posts for the month included NO posts from my page, Kirsten Oliphant, but only my personal profile, Kirsten Kiki Oliphant, and a group member. (Way to go, Roland!!) That’s pretty significant, especially considering I post daily at least once or twice. I spent almost a month posting as my page. Once connected, you can toggle between posting as yourself and your page with a little dropdown arrow in the top right of the posting box. Now that groups have insights, you can do your own tests to see how your reach is affected! 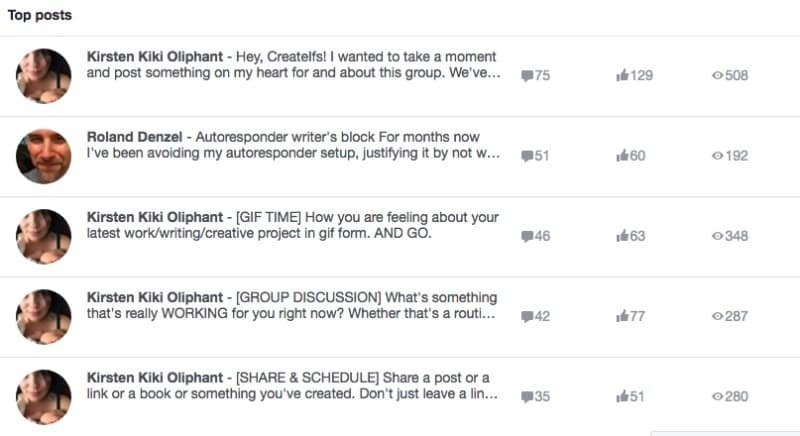 So, should you start a Facebook group if you haven’t already? I do think that reach will go down as a pay-to-play system moves into place as it did for pages. This is the reality of building on someone else’s free platform. 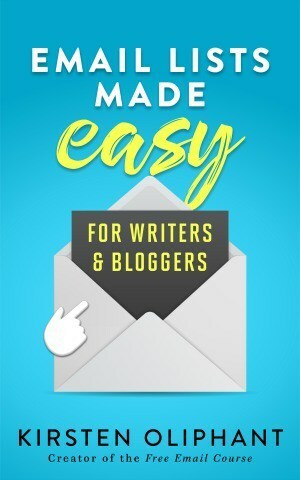 (So build that email list! 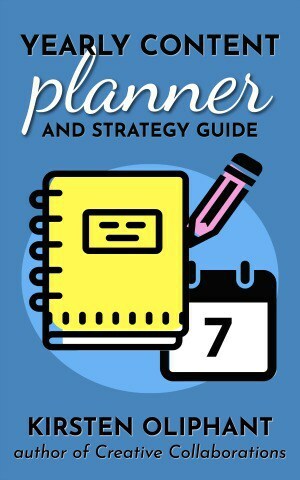 I’ve written a great book for getting started if you need help.) We don’t know exactly what this looks like or will look like. But for NOW, Facebook groups can really be great if you want to build a community. My email list is my main jam, but it’s kind of like a wheel: I’m at the center, having one-to-one interactions that move out from me at the center. Facebook groups are a little more like those messy spiderwebs. I’ve done the work to build it, but rather than having all the separate spokes, the web of people weaves together and connects. It allows for COMMUNITY. Which is pretty special. If you want to start a Facebook group, sign up to watch a thorough training I did earlier this year about pages & groups! It will help you get off the ground and create a thriving community on Facebook. 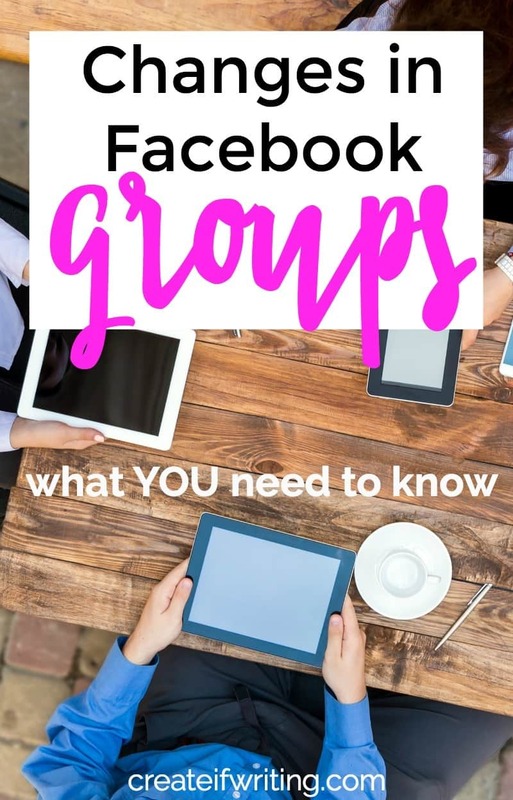 Need more resources on building up your FB group? Here are a few helpful posts! Want help with your Facebook page? Here are a few helpful posts! Questions? Thoughts? Comment below! I’d love to know your experience with Facebook groups! « Are Facebook Messenger Bots Replacing Email? It will be interesting to see how Facebook evolves in the coming year. I have a feeling ads will be finding their way into Facebook groups as well. Yes! They totally are. I know some groups have seen them, so it’s a beta thing that’s coming. Ugh! There is one thing I’ve learned about groups managing six large ones in the last two years: the ones that are most successful start out with a focused purpose and are not allowed to turn into a 100K free for all. If it’s a writer’s group, it should talk about writing stuff. If it’s a marketing group, it should be restricted to marketing. I’ve seen fiction writers use groups to manage reader teams, street teams, and influencer groups. Works well for some but they are definitely present and keeping the conversation going. Just having a group to have a group is kind of a waste in my thinking. But then I am a minimalist with an aversion to marketing that doesn’t have a goal. Thanks for the update. I do think this will be a big help to people with pen names who want to have groups and will no longer fear having to post as their profile names. Keep on keeping on! 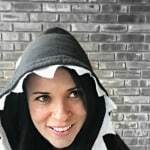 Thanks for your post – I’m curious if anyone with a linked Page & group has noticed recent changes. This week, FB forced me to personally join the group I admin for work in order to view group posts. (I’ve been able to do this for the last 6 months just from the Page). And if I set up a group event, my personal account is showing up as the host. Super frustrating! Is there a way to post as the group name without linking to a page? Or, is there a way to create a page where you are able to accept certain people? 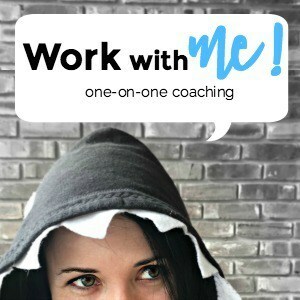 I ask because I am needing to create a wellness group or page for employees of a business. It will have incentives for members so it needs to be exclusive for that purpose. Any suggestions? Thank you.